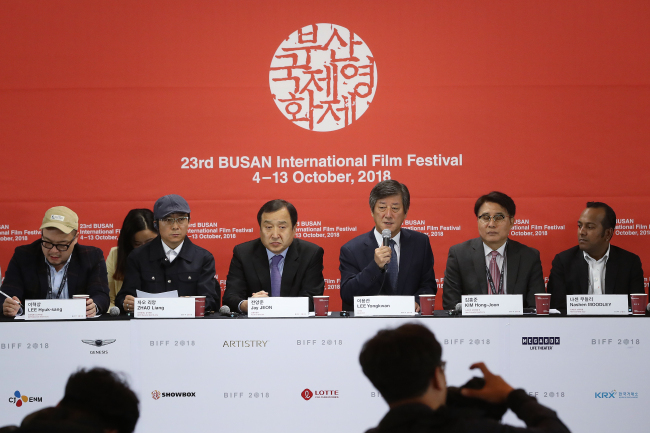 The 23rd Busan International Film Festival drew to a close Saturday, shaken by Typhoon Kong-rey, but having enjoyed its first year since its operations were normalized. Rounding off the festivities was the closing film “Master Z: The Ip Man Legacy” by Yeun Woo-ping, after the opening piece “Beautiful Days” had kicked things off 10 days earlier. The festival recognized those around the film industry for their contribution and prospects. Landing the top awards in the New Currents award were “Savage” by Chinese director Cui Si Wei and “Clean Up” by Korean director Kwon Man-ki. “Opening Closing Forgetting” by James T. Hong and “Army” by Park Kyung-kun secured the BIFF Mecenat Award, while the Sonje Award went to Kwon Sung-mo’s “Cat Day Afternoon” and “Nooreh” by Ashish Pandey. Actor and actress of the year awards went to Lee Ju-yeong and Choi Hee-seo for their memorable performances in “Maggie” and “Our Body,” respectively. The festival suffered some hiccups. The typhoon forced the officials to dismantle the outdoor stage and relocate or cancel the events there. Some of the visitors were left standing confused on Haeundae Beach on Saturday afternoon, as they were not notified that the free shuttles had been canceled due to the bad weather. A minor controversy occurred when a Japanese actor, Kunimura Jun, was asked by a reporter what he thought of Japan’s controversial Rising Sun flag, and he answered that he understood Koreans’ sentiment due to the bad blood between the two countries. Despite the obstacles, the festival managed to gather 195,000 participants, a minor increase from 193,000 the year before. The participants enjoyed 324 films from 79 countries -- 115 of them world premieres -- while 911 companies from 54 countries took part in Asian Film Market. This years event was the first since the 2014 “Diving Bell” controversy had led to a boycott of the last two festivals. After BIFF screened “Diving Bell,” a documentary about the Sewol ferry disaster earlier that year that was critical of the Park Geun-hye administration, an extensive government audit, the dismissal of key staff and a budget cut followed. Those in Korean movie circles lambasted the government intervention and boycotted the event, severely damaging the event’s reputation. This year’s festival marked the return of major players, including big name distributors like CJ E&M, Lotte, Showbox and NEW. But while the 2018 was expected to be a rebound year, the increase in attendance was not as pronounced as initially hoped, an ominous indicator that it may not be the marquee event that it once was. While it had been customary for distributors in the past to refrain from holding press conferences about their upcoming movie, press events including one for the new Ma Dong-seok film were held during the event. “In terms of reconciliation and normalization, I would consider the festival half a success. ...We found potential, but we didn’t manage to achieve everything completely,” festival Chairman Lee Yong-kwan said. The new goal for the BIFF now, Lee said, was for it to stay relevant in the new era. “The first arduous task at hand is for us to establish what it means to hold an offline festival in an online era,” he said. Lee added that the organizers should find ways to revitalize and enhance the Asian Film Market, while finding online applications for BIFF content.